The fate of Edward J. Snowden still held in the transit area of Moscow’s airport has nearly overshadowed the debate on the methods and extent of the National Security Agency’s surveillance and collection of information which Snowden made public. Each day brings more information about the degree of cooperation among the Silicon Valley firms and US intelligence services and between the US intelligence services and those of other countries such as Germany and England. Living in the transit area at the airport for several weeks and potentially longer was not Snowden’s plan when he left Hong Kong. As I had been blocked in the same transit area for three days in 1977 under the mistaken impression that I would be given a Soviet visa at the airport, unless things have improved greatly since the end of the USSR, it is not the sort of place where one wants to stay for a long time: a third class motel with an armed guard at each floor. He thought that he could travel to Moscow and then Havana and on to Ecuador, Nicaragua or Venezuela. However, before Snowden could make a Havana connection, the US government revoked his passport, and Ecuador withdrew the safe-conduct pass he had used to leave Hong Kong saying it had been issued by a consular official in contravention of Ecuadorean law. Without a travel document or a Russian visa, Snowden has no way to travel outside the transit area even to the Embassies of Ecuador or Nicaragua or Venezuela which are considered by diplomatic convention as being the territory of that particular state. The degree of US pressure was evident when France, Italy, Portugal and Spain refused to allow Bolivian President Evo Morales’ official jet to overfly their territory on its way from Moscow to La Paz after a rumor, no doubt planted by US agents, that Snowden might be aboard. Morales’ plane ultimately landed in Vienna, Austria for 13 hours until Spanish officials were satisfied that Snowden was not on board. Why it took 13 hours to check all the hiding places on a small jet has not been explained, but the move no doubt discourages any commercial lines no matter what over-flight agreements they have. Snowden’s presence in the Moscow airport transit area has attracted too much attention for the Russian police to look the other way while Snowden is taken to a Latin American embassy. It is not clear that anyone wants to repeat the experience of Ecuador which has allowed WikiLeaks’ Julian Assange to live in its London Embassy for over a year. To break out of Snowden’s “Catch 22” situation of no passport-to travel-no travel- no asylum – a world citizen passport was issued to Snowden on July 7, 2013 by Garry Davis, who founded the Registry of World Citizens in 1949, and today is the president of the World Government of World Citizens, which has issued hundreds of thousands of passports since its creation. The world passport is now reportedly in Snowden’s hands. In practice, some people have crossed frontiers with world citizen passports and world citizen identity cards and often had the passport stamped with an official stamp. It is not sure that the frontier officials knew what they were stamping or were very aware of cosmopolitan ideals. It is likely that most officials don’t want long lines of people waiting at frontier posts or filling transit areas at airports. Article 13(2) of the Universal Declarations sets out the right to leave and return to one’s country, though it does not speak of the right to travel to other countries. It may be that Putin would be happy to have the whole Snowden story go away. While I have never thought of Putin as a “world citizen” type, let us hope that he allows the airport officials to stamp the world citizen passport in recognition of the growing global spirit. The world passport and the pulling by Ecuador of its safe-conduct pass brings to mind an event I knew but had not thought about until a recent New York Times article highlighted the efforts of Aristides de Sousa Mendes who was consul of Portugal in Bordeaux when Germany invaded France in 1940. France already had a good number of refugees from Germany, Central Europe, Republican Spain as well as French, particularly Jews who feared what Nazi policy in France might bring. De Sousa Mendes and his staff worked day and night and issued 30,000 visas so people could escape to Portugal and then beyond. It took a couple of months before the Fascist government in Lisbon realized what was going on, recalled de Sousa Mendes, fired him and informed the Spanish government of Franco not to recognize the visas issued in France. De Sousa Mendes died in poverty, but his travel documents had saved many lives. 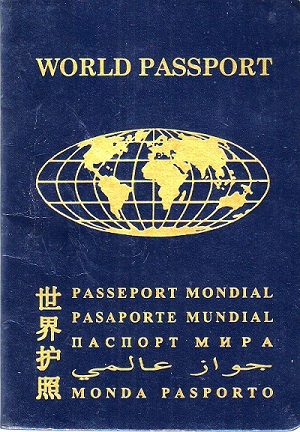 The world citizen passport is not a governmental document the way de Sousa Mendes’ were, but world citizen passports and identity cards are a symbol of a “higher law” than that of states. Let us hope that some Russian officials are in tune with the higher law. This article originally appeared on Transcend Media Service (TMS) on 22 Jul 2013. Anticopyright: Editorials and articles originated on TMS may be freely reprinted, disseminated, translated and used as background material, provided an acknowledgement and link to the source, TMS: A World Citizen Passport and Edward Snowden’s Catch 22, is included. Thank you.